I was reading up on roasting birds one time and it got quite overwhelming as there are just so many ways to do it. Some like to brine overnight to retain moisture before cooking, some require cooking over a bed of vegetables, some prefer to put the vegetables and maybe a bread mixture in the bird as stuffing. But I stumbled upon Thomas Keller’s recipe on Epicurious.com and this, by far, was the simplest, most delicious bird I ever ended up roasting. And best of all, it’s insanely simple. I had actually seen Chef Keller demonstrate this on a segment of No Reservations a couple years back and was quite skeptical of the deceptively uncomplicated technique. But I’ve done this a few times already and I’m now a believer. The method relies on cooking with dry heat. And I find this intensifies the flavor of the chicken as opposed to steam cooking it in a moist environment with, let’s say, a bed of vegetables. Or stuffing it with lemons. One 1 to 1.3kg chicken. You can use organic, free-range or whatnot. I just picked up a package in the freezer section. Defrost overnight in the refrigerator and bring out about 1 hour prior to cooking so it comes to room temperature. This is vital so that it cooks evenly. The original recipe calls for optional minced thyme. But I had fresh oregano in the garden so I used a few sprigs of that. Other woody herbs as rosemary would work also. Preheat oven to 450°F. I used a turbo broiler as I was only cooking one bird. Plus the convection function distributes heat more evenly. Rinse the chicken inside and out and towel dry. Take out as much moisture as possible. Season. Then truss it. You can either truss the bird with or without string. But its important to truss in general so as to the meat cooks as evenly as possible. Also, it looks better when cooked; as opposed to a splayed out end product. In any case, the chicken I used out of the package was already trussed (without strings, legs tucked under fat flaps). I just un-trussed, cleaned and dried the bird, seasoned and re-trussed after. A note on seasoning the bird: salt liberally. Let salt rain from about a foot above. Sprinkling till it covers every square inch evenly. This will make the skin crispy. 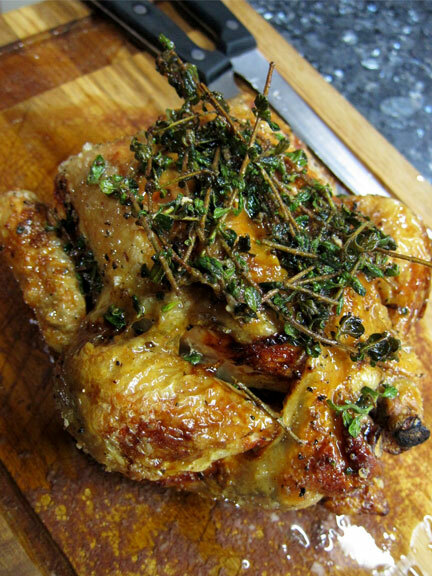 (As an option, you can rub a teaspoon or so of olive oil all over the skin to create more even browning. But not butter as that will create steam.) Season inside the cavity as well. Then season with pepper to taste. 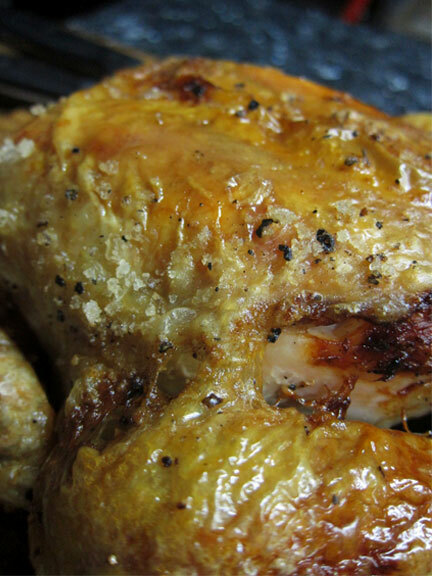 Put the trussed chicken on a roasting pan and in the oven. In my case, I put it on a rack in the turbo broiler. Then go read a book. Watch an episode of Game of Thrones. Or take a nap. You do not have to baste this with any kind of liquid every five minutes. Or turn it. Or poke at it. Just leave it alone. Just make sure to come back about 50 minutes after. 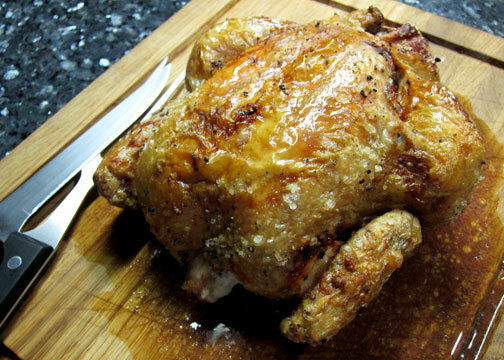 Check if the juices between the joints run clear, if so the chicken is done. Pull it out and let it rest on a board. There will be some lovely drippings at the bottom of the pan or broiler. You can skim a bit of the fat off but, really, rendered chicken fat is love. I throw the oregano into this and let it sizzle and infuse with tons of flavor for a minute or two. Then I pour everything on the chicken as it rests. Leave for 15 minutes. Amazing how the skin crisps up beautifully and the super moist meat just pulls away from the bone. A simple recipe that produces decadent results. Did you use free range chicken? Despite brining, simmering endlessly, etc., I've never been able to cook one without it ending up tough and stringy and just inedible! Hi Tisha. I did not use free range, organic for the times I've cooked this. At the very least I used chickens labeled as "natural" and "antibiotic free" for what it's worth. However for free range I would think using the same high heat method with a shorter cooking time would work in theory. They are understandably leaner than broilers so I would not expect the same texture though. But they would have a more pronounced flavor. Let us know how it turns out!